Eggplant Apps: Why do I only see the live scoring page? Why do I only see the live scoring page? If you are on the iPad the navigation features are hidden when the iPad is oriented in portrait mode (taller than it is wide). As a result of this it's possible to launch the app and only see the live scoring page. To switch from this page rotate the iPad into landscape mode (wider than it is tall). You will see the navigation view appear on the left-hand side of the screen where you can access the rest of the app. How can I switch between multiple leagues? I am a software developer and Fantasy Football fanatic. 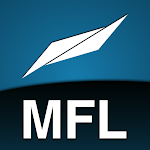 We currently have two apps in the app store, MFL Mobile and absorb. We hope you check them out and enjoy!